This veggie-packed falafel burger is a simple, healthy dinner. Slather yours with an easy yogurt dill sauce & you're guaranteed to want seconds! One of the best things about starting our blog are the friends that we’ve made along the way… the kindred spirits who share the same passion for cooking and posting fresh, healthy food as we do. They’re the types of friends that, while in town visiting, don’t mind being asked to hold up a light diffuser for the perfect shot and will gladly accept their roles as hand models for your sponsored picnic. Today is a special day for our friends Sonja and Alex of the blog (and podcast) A Couple Cooks – their book Pretty Simple Cooking is out! To celebrate, we made these Falafel Burgers which were absolutely delicious and really pretty simple to make. What I like about this recipe (and really all of the recipes in this book) is that the ingredients are so easy to find. Usually falafel recipes call for chickpea flour, but it’s not necessary in this falafel burger made with canned chickpeas, whole wheat flour, carrots, onions, sesame seeds, cilantro, and a slew of spices. The mixture gets pulsed together in a food processor, the burgers get a quick sear, and then they finish baking in the oven. I’m finishing the last burger for lunch as I type this – this is a great recipe if you want leftovers! Oh, and don’t skip the yogurt dill sauce, it’s so delicious! These days, “simple” cooking often means “fast! easy!” or “10 minutes or less!” Pretty Simple Cooking instead says that simple cooking should be about thoughtfulness and love for food, the process of cooking it, and the people around you. This book is for anyone who feels intimidated to step into the kitchen, because Sonja has such encouraging lessons about life, love, and food. It’s also for food lovers of any level looking for creative recipes to up their veggie game. The next recipes on my list to try are their Eggplant Parmesan Casserole, Red & Green Enchiladas, and Veggie Supreme Paella! We love to serve these with sweet potato fries. If you want more veggie burger recipes, try this one or this one next! Reprinted from Pretty Simple Cooking by Sonja and Alex Overhiser, with permission from the publisher. Make the burgers: Drain and rinse the chickpeas. Blot them with a paper towel or clean dish towel to remove any extra moisture, then place them in the bowl of a large food processor. Add the sesame seeds and process for a minute or so until a paste-like consistency is formed (if necessary, stop and scrape the sides of the bowl, and process again). Scrape the mixture into a large bowl. Peel the garlic, red onion, and carrots. Chop the onion and carrot in rough chunks. Add the garlic to the food processor and process until finely chopped. Add the carrot and onion and pulse several times until finely chopped. Add the cilantro to the processor and pulse a few more times until chopped. 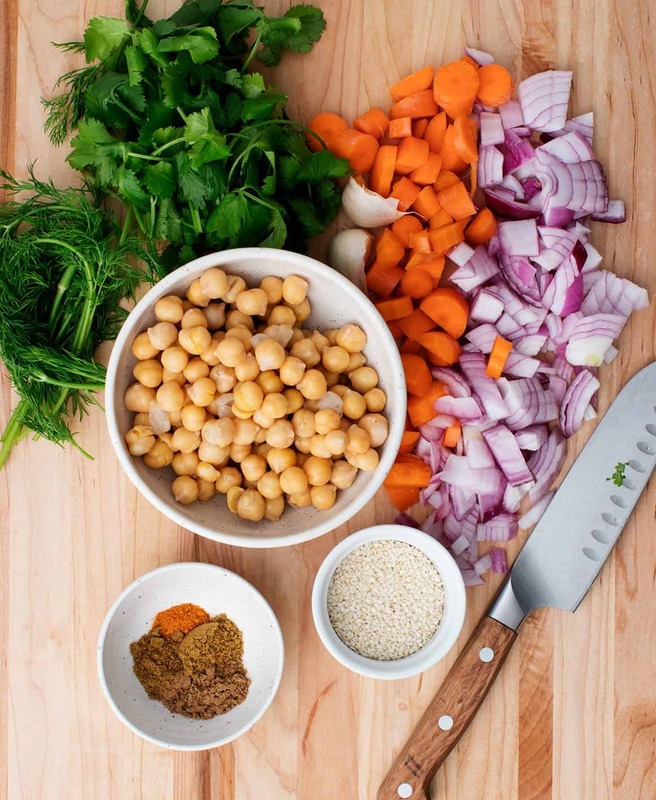 Scrape the vegetables into the bowl with the chickpeas. Stir in the flour, cumin, coriander, cayenne, kosher salt, and black pepper. Mix with a spoon or with your hands until fully combined, then form 8 round patties and place them on a baking sheet. In a large skillet, heat 1 tablespoon olive oil over medium-high heat. Add 4 of the burgers and fry them for 1 to 2 minutes per side, until golden brown. Remove the cooked burgers and place them back on the baking sheet. 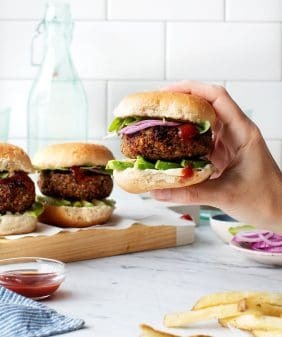 Wipe out the pan, add an additional drizzle of oil, and fry the remaining 4 burgers, keeping in mind that the pan will be hotter and the cooking time slightly quicker for the second batch. Once all burgers are browned, place them in the oven on the baking sheet and bake 15 minutes on one side, then flip and bake another 15 minutes. Remove from the oven and place on a wire rack to cool for at least 10 minutes. Make the sauce: Peel and finely mince the garlic. Chop the dill. Juice the lemon. In a small bowl, stir together the garlic, dill, lemon juice, Greek yogurt, olive oil, kosher salt, and 2 tablespoons water. Store leftovers in a sealed container in the refrigerator for to 2 weeks. Assemble the burgers with the yogurt sauce and desired fixings. Store leftover burgers refrigerated for up to 5 days, or frozen in an airtight container or plastic bag. To reheat, heat straight from the refrigerator or freezer in a 375°F oven until crispy and heated through; about 8 minutes for refrigerated burgers and about 15 minutes for frozen burgers. I love to make lack bean burgers! 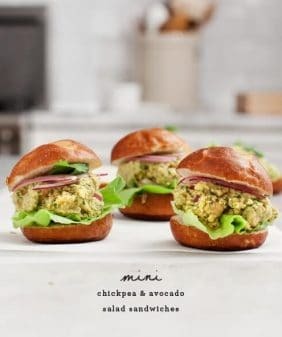 Looking forward to trying the chick pea burgers…. black……😏. ya gotta try the veggie lasagna! all the great pics make me wanna eat the pages! This looks delicious! I wonder if they’d BBQ well in the summer? Sheet pan dinners are my favourite pretty simple recipe! Every Monday night I throw last week’s starting-to-go-bad veggies, sweet potato, garlic, oil, tofu/tempeh/beans and a large helping of paprika, oregano, parsley, onion powder, chilli powder, salt, and pepper on a tray and bake it until it’s done. It never fails and it helps me minimize food waste (which is a no-no in my books)! soyaki chicken and rice. simple, easy, and delicious. black bean soup in the instant pot! 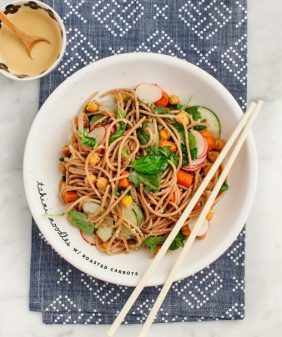 My go-to is soba noodles with tofu or tempeh, in-season veggies and tahini sauce! These look and sound fabulous, I will give them a try. My fast and easy meal is green salad and a baked potato with salsa. I love making a stir fry with whatever veggies I might have on hand, a protein (tofu, chickpeas, or edamame) and serve over rice (great option when having premade the rice) or over rice noodles (which are really quick to cook up). The first cookbook from Sprouted Kitchen has a recipe for a lemony, mustard, olive oil beach day tuna fish salad that is to die for. Super easy and without the nasty mayonnaise. I modify by using my citrus juniper salt and adding celery leaves if I have them. Sooo good. Can’t wait to try this! 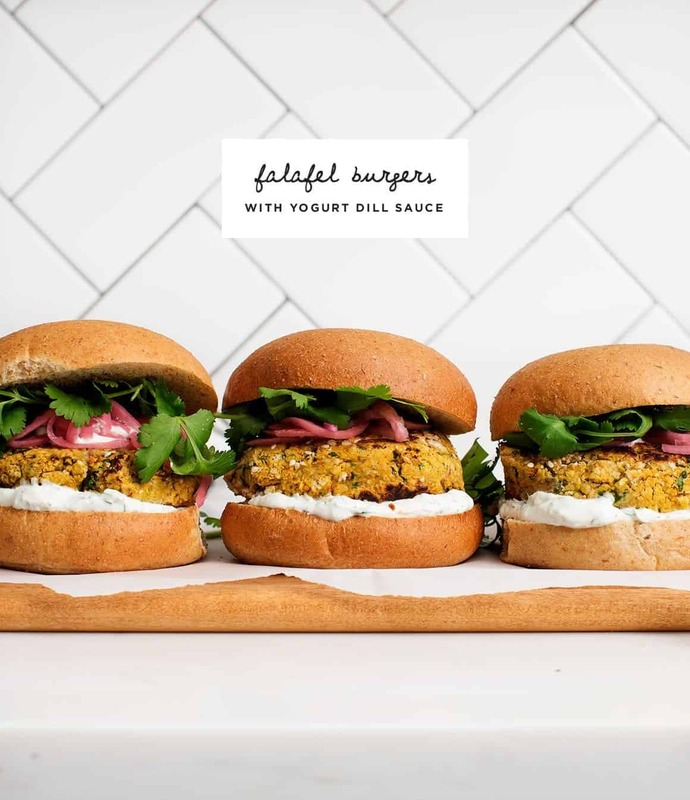 I’d love to make these Falafel Burgers with Yogurt Dill Sauce! I love falafels anyways, so why not try them as burgers! I love making hummus! So simple and satisfying! Butternut squash and black bean enchiladas! I made your recipe and I loved it, so did my husband. Torn between black bean quesadillas and this lentil soup: https://www.mezonthemove.com/blog/2017/12/the-only-lentil-soup-ive-ever-eaten. SO GOOD but more importantly SO EASY. I love to make a tomato sandwich! Yes! With a slice of provolone and mayo! cooked pasta–shell, rotini, whatever you have, spaghetti sauce, shredded smoked gouda and mozzarella–add some frozen peas and bake in a 9 x 13 pan for 30 minutes at 350 degrees! The falafel burgers sound delicious! Im looking forward to trying them! any kind of hummus – lately its been beet hummus – but anything with tahini is it! Peanut butter sandwich would probably be the easiest thing I make that I just love. But, I really like making bowls…..beans, grains, veggies….you can be so creative! Toast and smear almond butter on top. Delish!! My husband uses date pecan butter. That’s pumpkin PANCAKES with chopped pecans. My go to recipe is usually a simple pasta dish such as pasta with garlic and olive oil, or pasta with fresh tomatoes, garlic and feta cheese. Sooo good. My favorite simple (and healthy!) recipe is lentil soup. I just throw whatever veggies I have on hand into a pot with lentils, some spices and stock, then top it with a little lemon juice or balsamic vinegar. It’s foolproof and delicious! Sausage and peppers! Eager to try your falafel burgers. I take a couple of apples and slice them as thin as I can (leave peels, or peel them). Lately I’ve also been slicing up a couple of pears the same way. While I’m slicing the pears, I throw the apples in a skillet over medium heat, with either olive oil or coconut oil and stir now and then. It’s great either way. Once the pears are sliced I add them to the apples. When the apples begin to soften I add a couple of handfuls of frozen berries (I try to keep blueberries, raspberries and marionberries on hand) and stir them in. I stir the mix occasionally to avoid sticking/burning. I cook this mixture until the apples get pretty soft…and, some varieties of apples will keep their shape for much longer than others. I love using a mixture of apples…and pears, for that matter. When it’s cooked “long enough” for all the flavors to cook into each other I turn off the heat and let it cool for a bit. I use wide-mouth 8 oz canning jars for storage. These freeze safely in the freezer. YUM. I love making some sort of curry with lots of vegetables and rice on the side. Lentil-Rice casserole is my go-to easy peasy recipe. It’s just lentils, rice, veg broth, dried veggies (onion, mushroom, bell pepper, carrot most often), and spices all thrown together and baked. If I want to fancy it up I will saute onion, celery, carrots, and garlic and use that instead of the dried veggies. It’s easy to mix it up seasonally by adding diced butternut squash, thyme, and sage in the winter, and summer squash, lemon zest, and oregano in the summer, etc. It was one of the first vegan recipes I learned to make 32 years ago, and we still love it. 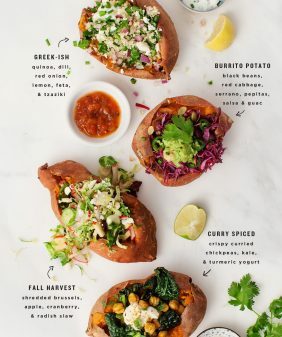 I love to make simple sweet potato buddha bowls! My ‘pretty simple recipe’ is spaghetti squash (started in the microwave, finished on a sheet pan in the oven) with roasted grape tomatoes and garlic cloves (on a separate sheet pan, tossed with EVOO). Plated together and sprinkled with fresh herbs and/or herbed toasted bread crumbs and plenty of Parmesan! My favorite simple recipe is piling a piece of toast with sautéed veggies and wilted greens then putting a fried egg and all of the tahini on top! Its always a winner! Banana spinach pancakes! Made in the blender, deliscious and healthy. What is this recipe? Sounds good! My favorite simple meal is either 30-minute chili or fried egg sandwich with all of the toppings! I like to make a simple one pan dish based on a recipe from 101 cookbooks/ Heidi Swanson. I saute small cubed red potato and shallot in some olive oil/salt, covered until potato softens/browns, then I add in come chickpeas and let them brown a little. Last step is to add in sliced or shredded green cabbage and let it wilt a bit. Final touches are some chopped parsley, lemon juice and parmesan cheese if I have some on hand. It’s very good and fairly easy to whip up. Love one pan dishes! I love making a big salad with sweet potatoes, chickpeas, and a tahini dressing! One pot veggie stew is great as wel! I love to make spicy lentil soup when I need a pretty simple meal. Lentil and potato tacos is an easy favorite! I love to make a Persian spinach yogurt dip topped with dried mint. Def a recipe where the whole is much greater than the sum of its parts! 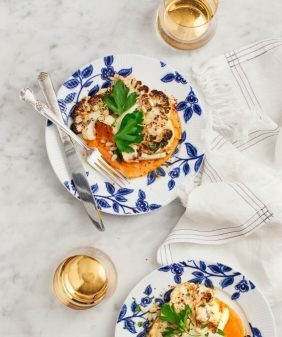 One-pan vegetable lasagna — all ingredients are haphazardly layered into a cast iron skillet and thrown into the oven. A perfect comfort food for these chilly winter days, and better for the heart, too! Looks like a beauty of a book! I can’t wait to make these tonight. I just had a baby so i think all off my recipes these days are quick and easy. One of my favorites is stuffed peppers or quick vegetable stir fry! Our family favorite quick meal is a red thai curry. That container of paste is my magic ingredient – everyone thinks it’s so hard to make, but it’s 1-2-3 and flexible with whatever was in the CSA that week. Love Sonja and Alex, would love to win!! I would like to learn how to make hummus with different flavours. I would like to make the falafel burgers! I’d love to check out Pretty Simple Cooking! I’ve now heard about it from two different bloggers and it just looks beautiful. My FAVORITE simple recipe is the Smitten Kitchen’s peanut butter cookie recipe with just 4 ingredients. It happens to be gluten free (bonus for those of us with GF’ers in our lives) and is intensely peanut buttery! A win win if you ask me! The chickpea curry salad for sandwiches was amazing! So easy to make with a ton of flavor. It is one of my regular lunch rotations. Thank you for this lovely authentic recipe Jeanine! I will definitely give it a try on this weekend and your pictures are amazing! I love to make burrito bowls with roasted peppers and sweet potatoes, tofu or beans, and a quick avocado sauce on top over some rice. The cookbook looks great! I’m a sucker for avocado toast on some fresh crusty bread with lemon juice, red pepper flakes, and a sprinkle of nutritional yeast or hemp seeds! But what can I substitute for the cilantro? My husband hates it and I never know how to replace it. Thank you!! He probably wouldn’t detect it cooked into the burgers (if you leave it off the topping), otherwise, I’d say parsley would sub in fine! Any veggie fried rice to use up what’s left in the frig. With an egg. Lately, I’ve been making a red lentil curry – delicious and ready in 30 minutes! Can’t beat some good old bean burritos with lots of hot sauce for a quick & simple dinner! Homemade maple/nut granola and plain greek yogurt with whatever fruit is on hand. That and peanut butter on a spoon. My go to simple meal is a veggie frittata! Chop onions, garlic and new potatoes, saute and cover with beaten eggs! Chicken + veggie fajitas! So simple, but so tasty! And perfect for making fajita salads for lunch the next day. Chicken tacos are one of my favorites! You just shred a chicken and saute it with some garlic, bell pepper, oregano, onion, and add some stock to let it finish cooking. It’s really great on top of rice or quinoa too. Homemade naan bread pizza is one of my easiest to-to’s! Oooh. They look delicious. I love to make a tomato sauce, throw in some chickpeas, tamarind paste and top with chopped cilantro. Hope you try it, it never fails. I’d love to make a pasta that has a garlic butter sauce with fresh sage! I love to make lentil soup. Simple and so satisfying! The burgers look delicious, will have to give them a try! One of my favorite simple recipes is a breakfast tofu scramble topped with nutritional yeast and some greens. Sweet Potato, Lentil, Coconut Curry. I’m in the process of whipping up a batch now! So yummy and good for you! These look so good! I’m already getting excited for barbecue season! This time of year, I love sweet potatoes in pretty much any form. However, my favorite way to make them in roasted whole, split open, and generously topped with miso butter. It feels like the fanciest baked potato. I make two different vegan pancake mixes that keep in the pantry a couple of months and are ready with just the addition of mylk: a whole wheat mix and a gluten free buckwheat mix. When I make pancakes for our breakfast that makes it really easy. Plus, I bake my pancakes in the oven, which means I can do yoga whilst they’re cooking instead of having to hover over the stove. Whew! No, YUM! I love to make some sort of veggie bowl for a quick weeknight dinner. My favorite recipe at the moment consists of sliced roasted sweet potato (made ahead for the week), spinach, sprouts, black beans, and pineapple with a bit of guacamole, salsa, and a drippy sunny-side up egg thrown on top. I love making Kale Guacemole – I made it this week and now my favourite. These burgers sound so delicious! I think my favorite simple recipe is a basic green salad with homemade dijon mustard vinaigrette — so easy and so perfect. Thanks for the giveaway opportunity! Looks amazing! Love the simple recipe of the kale guacamole! Yummy and healthy!One of my favorite dishes to make is zoodles with tomatoe meat sauce. Ingredients zoodles, grass fed ground beef, basil, oregano,thyme, garlic, tomatoes, extra virgin olive oil! Simple soup with boullion, chopped veg and noodles. I love butternut squash soup with lots of fresh ginger…lots. A simple recipe I like to make is homemade muesli. My go-to meal depends on what’s in the fridge/freezer; a favorite is to toast rustic sourdough bread and when just out of the oven, top with thinly sliced sharp cheddar (a good domestic like Tillamook; or a hearty English). After letting the cheese soften from the heat of the bread, top with sliced tomatoes and a little ground pepper. Voila! This works any time of day or night or any season. I love to make Philly Portabella-Steak sandwiches. Portabella mushroom strips cooked in skillet with colorful peppers and onions – seasoned with Braggs, creole seasoning, and garlic. Top with slice of Daiya Vegan mozzarella cheese and serve on a toasty roll. So far, everyone loves this quick and tasty meal. Made the falafel burgers last night. Very good. Went together quickly too. Lots of ingredients, but this was easy. Will make again. I’ve never made falafel before, but this recipe looks like the one that will finally inspire me to give it a try! Thanks for sharing. My favorite pretty simple recipe is usually a pasta + veg + poached egg (or, if we’re being honest, sometimes a fried egg for simplicity’s sake). Usually I throw together whole wheat spaghetti, chopped kale, garlic, onion, chili flake, poached egg, and toasted bread crumbs. It’s exactly what I always crave… after a long day of work, after a weekend of too much wine… it’s satisfying and easy! Brilliant! Just what I was looking for. Every month I have a family get together and its my turn to cook. I wanted to do Burgers, but I was struggling for a nice veggie option for a family member. Thanks for this, I am sure it will go down a treat! hmm, I can’t be sure without trying it, but I think it should be fine. Love your blog! Is the browning step necessary if I’m just reheating the burgers anyway? Thanks! Ohhh this looks soo good for you! Can’t wait to try out and have it for lunch! Wow this looks incredible! Putting this recipe on my list to try for sure. This is the best veggie burger I’ve made. I think I’ve found my ultimate recipe! I made one substitute: I used non-fat Greek yogurt instead of 2%. For everything else, I followed the recipe exactly, and I will make it over and over, I know. I serve it open-faced on toasted whole-wheat toast, topped with lots of the yogurt sauce, toasted sesame seeds, my own pickled red onions, and a huge amount of baby arugula. This is outstanding in every way. Trying this out. Never had a falafel burger, but I love falafel wraps. Your falafel burgers are awesome. I would give it a 10 rating. Thank you for the recipe. I would love to have a copy of your cookbook. These were delicious. I sweetened the yogurt dill sauce with a bit of honey…then added some Tabasco and a dash of smoked paprika. Thanks for this great recipe. I’m so glad you loved the burgers!